Foreign companies may conduct business in the Dominican Republic by setting up a branch office, incorporating a local subsidiary or acquiring the shares of an existing Dominican company. Any company duly organized and existing in accordance with the laws of its country of origin can set up a branch in the Dominican Republic by registering at the Business Registry and obtaining a tax number from the Internal Revenue Agency. Additional approvals may be required in certain regulated industries. Registration requires that (a) all incorporation documents of the foreign company be translated into Spanish and authenticated, (b) corporate minutes establishing a registered office in the Dominican Republic and naming a local representative, and (c) particulars of the local representative and the company’s shareholders. Registration is not necessary if the activity of the foreign company is limited to acquiring equity in a local business entity or to occasional transactions in the Dominican Republic. Local branches of foreign companies receive the same tax treatment as Dominican companies and are subject to the same local laws and regulations in labor and other matters. For tax purposes, they must keep separate accounts from their head office so as to facilitate the determination of their income. The most common structures available for investors to establish a local subsidiary as an independent local business entity in the Dominican Republic are the Limited Liability Company, the Corporation and the Simplified Corporation. These three types of companies enjoy limited liability for its shareholders, meaning that if the company fails, they will be liable only for the amount of capital invested, and that shareholders, individually or collectively, are not liable for the debt obligations of the company. This limited liability protection afforded to shareholders of these entities is strictly observed under the law, except in case of fraud or misrepresentation. Other business structures exist (Individual Limited Liability Companies, Partnerships, Limited Partnerships and Limited Partnerships with Shares) but they are rarely used by investors because, in the case of Individual Limited Liability Companies, the sole shareholder must be an individual, and in other cases, the partners do not have limited liability. All business entities are taxed in the same manner, in contrast to the practice in other countries such as the United States. Please refer to the chapter on taxation for details. Shareholders, partners, members, officers and directors of a Dominican company do not need to be Dominican citizens or residents, except in very special circumstances. Corporations are best suited for large businesses with many shareholders where protecting minority interests is important. They are the only entities that can raise capital through public stock offerings. Simplified Corporations are best for medium to large-sized businesses that require special shareholder provisions for corporate governance purposes. Simple Corporations cannot raise capital through public stock offerings, but are able to issue debt instruments to the public. Limited Liability Companies are ideal for small to medium-sized businesses, the most common in the Dominican Republic, reason why LLC’s are very popular for local investors. LLC’s cannot raise capital through public offerings. LLC’s must have no less than two shareholders and no more than fifty. To form an LLC, a minimum capital of 100,000 DOP is required (about $2,200 at the exchange rate current in December 2015), which must be paid in full, and divided into shares with a par value of at least 100 DOP each. Shares in an LLC are nonnegotiable. Share transfers to third parties who are not current shareholders must be approved by 75% of the votes of the company, except in certain cases, such as when the beneficiary is a child or parent of the person doing the transfer. Nonetheless, if the transfer is rejected, the shares in question must be purchased or redeemed by the other shareholders or the company. Management of an LLC is in the hands of one or several managers or a board of managers. Managers must be natural persons, not other companies. Unless otherwise stipulated in the bylaws, no inspection officer (comisario de cuentas) is required to oversee management. Simplified corporations must have a minimum of two shareholders but, unlike in the LLC’s, there is no maximum. The minimum capital required to form a Simplified Corporation, called the company’s authorized capital, is three million DOP (about $66,000 at the exchange rate current in December 2015), of which at least 10% (300,000 DOP or $6,600) must be paid-in upon incorporation. Shares in a Simplified Corporation are negotiable, although restrictions may be established in its bylaws. Management of a Simplified Corporation is freely determined by its shareholders in the company bylaws. It could consist of a board or of one or several individual managers. Members of the board and individual managers do not need to be natural persons. Simplified corporations can issue debentures and bonds privately, although not publicly. Corporations must have a minimum of two shareholders. There is no limit on the maximum. The minimum capital required to form a corporation (minimum authorized capital) is 30 million DOP (about $666,000 at the exchange rate current in December 2015), of which at least 10% (3,000,000 DOP or $66,600) must be paid-in upon incorporation. Shares in a corporation are negotiable, although certain restrictions may be established in its bylaws. Corporations can be private or public. Only public corporations can offer the sale of stock and bonds to the general public. The management of corporations must consist of a board of directors of at least three members, which do not have to be natural persons. An inspection officer (comisario de cuentas) is required to oversee management and to render an annual report to the shareholders meeting about the company’s financial statements and the performance of the board of directors. The value of company shares as well as its capital can be stated in foreign currency. All companies can issue common shares and preferred shares. Preferred shares may grant the shareholder the right to a fixed dividend or a fixed percentage of profits, or both at the same time, as well as priority rights over the company capital in case of liquidation. Company formation is best managed by a local attorney, and carefully monitored by you. If your attorney does not guide you in selecting the best company structure for your needs by explaining the advantages and disadvantages of the various options, change your attorney. Make your selection only after you are well-informed. Formation should be customized to fit the needs of company members. Note that a member need not be a Dominican citizen or resident to form a Dominican company, except in very special circumstances. As a member, you will be required to provide certain particulars such as your full name, nationality, occupation, marital status, and address, and where applicable, a copy of your passport, “cédula” (Dominican identification), and/or driver’s license. The process involves five basic steps. Clearing a company name can be time consuming as most commonly selected names are already in use by others. Therefore, if time is important and the company name is not immediately critical, you have some options. Many law firms retain shelf companies that are ready to go and available for purchase at a premium price. However, if cost is a factor, you can still expedite the registration process by selecting a “numbered” company (e.g., 12345 S.R.L. ), and opting to change the name later. This two-step process will incur extra costs, but will expedite the registration process with the advantage that you will establish a legally recognized company more quickly. The documents required will depend on the particular structure selected, but will include at a minimum the articles of incorporation and by-laws (“estatutos”). Be forewarned that Dominican company organization taxes are higher than those imposed on American companies. This particular tax amounts to 1% of the authorized capital for corporations and simplified corporations, and paid-in capital for S.R.L. and E.I.R.L. structures. The incorporation documents must be filed at the Business Registry for the area where the company’s registered office is located. Registration fees for corporations and simplified corporations are calculated on the basis of the company’s authorized capital; fees for LLC’s are calculated on the basis of its paid-in capital. A company is deemed to legally exist from the time its documents are recorded at the Business Registry. After incorporation, any documentation related to important corporate activities must be also registered at the Business Registry. Company registration at the Business Registry must be renewed every two years. To begin operation, newly-formed companies must obtain a tax number at the Dominican Internal Revenue Agency. Also, shareholders of the company, foreign or local, who do not already have an individual tax number must obtain it at this time. Without a tax number, a company cannot open bank accounts, buy real estate, nor, in general, operate within the country. All Dominican companies must hold an annual shareholders’ meeting to review the company’s operation during the previous year. Minutes of this meeting must be recorded at the Business Registry. Joint ventures in the Dominican Republic generally consist of a contractual arrangement between two or more existing business entities for the purpose of carrying out a particular project or task. The joint venture itself is not a legal person nor enjoys limited liability unless a new business entity is formed according to Dominican company law. Knowledge is the cornerstone of Guzmán Ariza’s service in company law. We actively produce and disseminate information that shapes this practice area in the country. 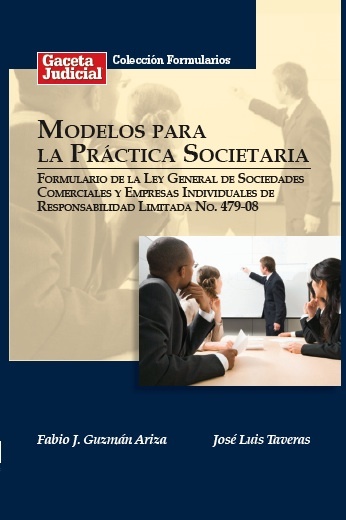 Fabio J. Guzman-Ariza, name partner and prolific writer on Dominican law, co-authored the only current book on company forms, Modelos para la práctica societaria. Partner Alfredo Guzman contributed further to Fabio Guzman’s seminal work with El funcionamiento de las sociedades de responsabilidad limitada, a book explaining how limited liability companies work in the Dominican Republic. Together, the two have contributed to preparing regulations to assist existing companies in the transition to current Company Law 479-08, and have co-authored additional articles on the SRL (LLC) company structure in the only Dominican law review, Gaceta Judicial. Our knowledge of company law is widely available, respected, and regularly referenced, and covers company formation, corporate governance, mergers and acquisitions, and dissolution; and related business areas such as contracts, employment, labor, company finance, company tax, litigation, dispute resolution, and intellectual property. By Guzmán Ariza name partner Fabio J. Guzmán-Ariza. 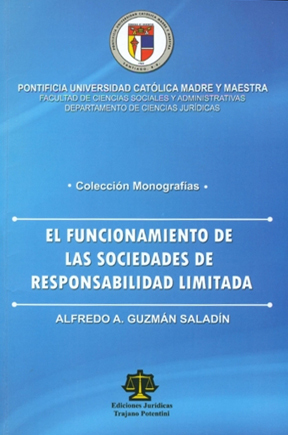 El funcionamiento de las sociedades de responsabilidad limitada (The Functioning of Limited Liability Companies: Santo Domingo, Pontificia Universidad Madre y Maestra, 2009. By Guzmán Ariza partner Alfredo A. Guzmán-Saladín.